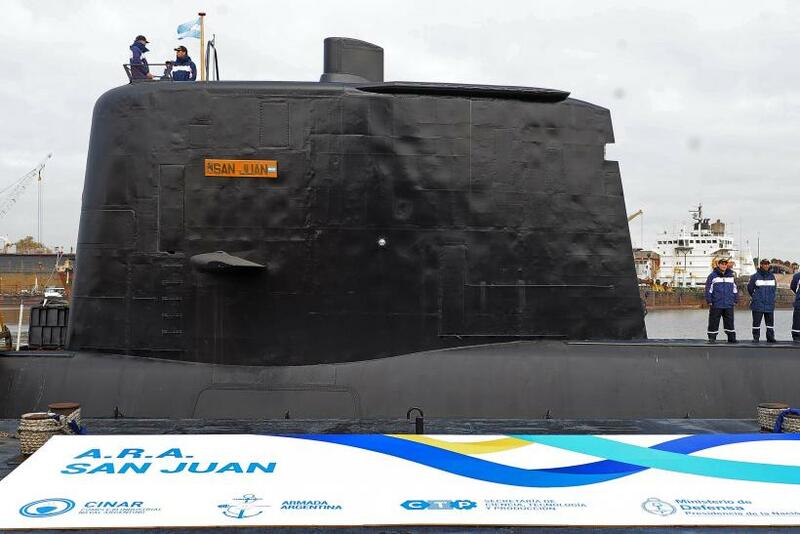 As the search for the missing Argentina submarine has entered a “critical phase,” the country's navy said Wednesday it was investigating an unusual noise detected in the South Atlantic hours after it last communicated with the vessel. The authorities, however, refused to confirm if the mysterious noise indicated an explosion. The BBC quoted a spokesperson who called the noise from the ARA San Juan a "hydro-acoustic anomaly,” but did not give a clear definition of the phrase. The Telegraph reported when the spokesperson, Enrique Balbi, was asked if the noise could have been an explosion, he declined to speculate and said: "It has to be corroborated and looked into. … We are in a very dangerous situation, and one that is getting worse." Balbi told the news network the situation was getting critical and "concern is growing more and more" as fears that the oxygen on board was close to running out. The submarine was carrying 44 crew members, including the country's first woman submarine officer and was last seen in the San Jorge Gulf, about 268 miles off the coast of Argentina, a week ago, on Nov. 15. According to experts, the submarine had enough air to last seven to 10 days if it remained fully immersed CNN reported, calling it the worst-case scenario. There were false alarms earlier when sounds were detected Monday in the South Atlantic, which were thought to have emerged from the submarine. However, Balbi said at the time it was highly unlikely the sounds were from the missing vessel and had likely come from a "biological" source. He added: "We all had hope, but unfortunately this comes from believing sources that are not trustworthy. Some sources were saying that this was banging on the hull in Morse code signals." Meanwhile naval investigator Fernando Morales told reporters: "If the captain stayed at the bottom because he thought it was more prudent to stay at the bottom, it's one thing. But at this point we have to think that if he's at the bottom, it's because he could not emerge." CNN said 11 countries joined Argentina in the search including merchant ships, scientific vessels and fishing trawlers. The countries contributed personnel, planes and boats. U.S. President Donald Trump on Wednesday tweeted saying he had given the order to send support for the rescue operations. However, family members of the crew criticized the rescue effort. “We are really amazed that they are not finding it, it is impossible at this stage that they don’t know where it is,” Claudio Rodriguez, brother of one of the crew members, said, Pittsburgh Post-Gazette reported. “How can you lose a 60-metres long navy vessel, even if it is under water?” Rodriguez said. “I feel a lot of pain because of the decisions that were taken,” said Elena Alfaro, sister of a crew member. CNN cited state-run news agency Telam which reported that Balbi said the conditions Wednesday were perfect for the aerial and nautical search. He also urged family members of the crew "not to lose hope."